"The Complete Elvis Presley Masters" 30 CD box-set collection contains all of Elvis Presley’s 711 Master Recordings as released during Elvis’ lifetime, mastered from the original analog master tapes. The collection also contains 103 additional rare recordings and a 240-page hardbound book featuring an annotated discography, original album artwork, rare and classic photos, a complete song index and an essay by Peter Guralnick. Housed in a beautiful, limited edition display case. 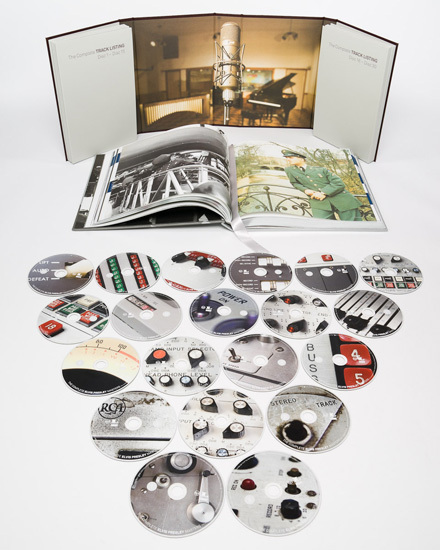 EIN's Piers Beagley investigates the new deluxe box-set indepth.. 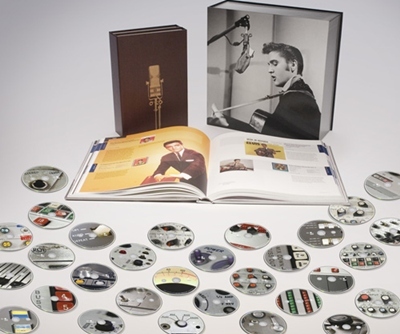 This has to be the ultimate deluxe Elvis collectors’ set, combining a massive 240-page book and every Elvis Master recording presented in one huge presentation case. It is almost impossible to cover such a mammoth project properly in a small review. The fact is that it also Sold Out before being despatched and so hardly needs a review. Plus it is damn expensive and well out of the range of most fans. Costing US$750 in the USA - plus for anyone overseas a hefty delivery charge. For me, in Australia, it is the value of a return flight to Hawaii! However it is good to hear that the popularity of the signed & numbered first run of 1000 copies has inspired SONY to produce a second edition early next year. So what do you get for your hard-earned money and, as hard-core Collectors, since we have probably already bought most of these recordings umpteen times before, is this set that desirable? Well the short answer is, Hell Yes! The first impression you get upon opening the cardboard packing is just how HUGE this whole project is. Although I had seen plenty of photographs, and all the publicity we have presented on EIN, I was still stunned by the very size of this box-set. It feels magnificent - it is gigantic. It totally dwarfs the recent The Beatles Masters box-set at more than twice its size. But so it should since The Beatles box-set features only 14 albums/cds of music recorded over 8 years, whereas this Elvis set presents 30 cds of music over a 23 year period covering all of Elvis’ SIXTY plus albums (not including cheap compiles) that were released over his lifetime. Holding the box-set there is a genuine weight (it’s heavy!) and gravity to it that makes you feel that you are holding something very precious – and you are! ALL of Elvis' Master recordings in one box! Who could believe it? To understand the magnitude and size of this set it is good to see images of the project as referenced against a standard CD - as we have done here. The CDs themselves come in a sturdy leather-styled foldout case, framed within a beautiful shot of a Neumann microphone used in RCA Studio B during the 1960s. Each CD features an image from some RCA equipment used in the recording of these classic Masters. There must have been some serious debate about what to print on the CDs as it would be all too obvious to use shots of Elvis throughout the years. But the designers keep those Elvis shots for the Deluxe book and, in this way, create a stylish and momentous presentation that immediately indicates that this is a "serious" study of Elvis’ music and not some cheapo product for the masses. This is where The Complete Masters is so different to the cheaper Franklin Mint set in the design & representation of Elvis’ work. This is a true coffee-table sized book. The weight of it, the silvered pages, silk-screened print on deluxe paper and stylish design all represent the detail and work that has gone into this project. The design is credited to Klaus Kempenaars and Mark Cremer. As you open the book the first page shows a great photo of Elvis at the ‘Love Me Tender’ session and laughing with the musicians helping set the scene - it's all about the music! There are a lot of huge double-page images spread throughout the book and they all help explain the recording process or help show the impact of Elvis’ creativity at the time. Again to really review the size of this project and the lovely design one needs to see inside pages again referenced against a standard CD for size. Some familiar photos now look stunning as huge double-page spreads.. I was amused to see that famous photograph of Elvis holding a gun to Colonel Parker’s head (during Love Me Tender filming) gets a double-page spread here! Could the authors be making a statement about Elvis’ creativity and the damaging influence of The Colonel? The first 20 pages of the book are dedicated to the 6000-word essay ‘"I Don't Sound Like Nobody": The Music of Elvis Presley’ by Peter Guralnick. While anyone who buys this book has probably read Guralnick’s two essential biographies of Elvis, the essay here focuses of Elvis’ musical creativity and nicely encapsulates the importance of Elvis. ..... "Everyone thinks they know the story. In one version, told frequently by friends and early musical acquaintances, Elvis Presley was a raw talent just waiting to ignite, with the spark provided by their direction or advice. Critics and historians have often painted him as some kind of visitor from another planet, so utterly different from everyone else he must have come from outer space. To his most ardent fans he is, of course, beyond either comparison or reproach. Others see him as a pawn in someone else's game, manipulated to fulfil or betray his greatest gifts. Each narrative takes a different line, but in every one it's as if he were a phenomenon simply waiting to happen. And once he did, he became ELVIS PRESLEY, immutable, larger than life, forever himself. Which, like so many other myths, has enough truth in it to be believable but not enough truth to be as interesting, complex, contradictory or ultimately indecipherable as real life." Guralnick helps explains the issues facing Elvis in the mid-sixties with those lightweight family soundtracks and pleasingly references one of my favourites. He picks out ‘I Need Somebody To Lean On’ as a mid sixties song that to listen to.. "If you want to experience the core of vulnerability that lay at the heart of Elvis music." He also raises some interesting points that I had forgotten, like the fact that Elvis filmed EIGHT movies between coming back from the army and the end of 1962! That is an unbelievable amount of work for anyone, yet alone a recording star and not an actor! It also helps demonstrates the ludicrous core-belief of Colonel Parker, that of quantity over quality. As always the final years of Elvis are difficult to explain without desperation creeping in. ... "(Towards the end) this is not to say that Elvis never connected with the material - there are poignant moments at the end, made all the more poignant by the spectacle of someone struggling so mightily to find his voice. "Whatever you do, don't be afraid of it," Sam Phillips had once told him, and he never had been - but now the fear was almost palpable. And yet people still responded to the music." And with his final comments explains the importance of Elvis’ work from the stunning fifties to the rubbish of the mid-sixties and on to the final sadness..
… "For twenty years Elvis bestrode the pop world in a manner unlike anyone else – and not, it should be noted, with a style that was either static or imposed upon him. Rather, he was an artist who continued to evolve, someone constantly reaching for something not quite within his grasp. Whether as the brashly shy teenager who could boast that he didn't "sound like nobody," as the pop idol who sought to redefine his work, or as the Las Vegas performer determined to incorporate every strand of the American musical experience, his mission remained the same: to carry his message out into the world. It was a message based upon the belief that there was something spiritual about music, that music could transcend the day-to-day burdens that we all bear, that it could reach across boundaries of color and class, create a sense of empathy for the other person, and erase categories – musical, political, and social – if only for the moment that it was being shared. Think of his work as indivisible then. Only in that way can one be true to the spirit of the music and the man." This is positive in that it is a very different book from ‘A Life In Music’, although at times I found it odd that some crucial session facts – like why Elvis was dissatisfied with the GI Blues RCA Hollywood soundstage recordings forcing a move to Radio Recorders - are not mentioned. Where new information has become available recording dates and session details have been corrected. For instance the dates of some of the SUN sessions have changed from the ‘A Life In Music’ data of ten years ago. The layout is very stylish and it has a beautiful look and feel. The pages feature hundreds of photos, Elvis at work in the studio, candid images, publicity photos, some quite spectacular. There are plenty that are not familiar, lots of candids, as well as several printed in much better quality and in a much bigger format than I had seen them before. And although we’ve seen the Jailhouse Rock single cover before a thousand times, we have never seen it with this sensational impact! It is notable however that some mid-sixties Soundtrack albums get no description at all apart from the basic facts. But also some of The Colonel’s wilder ideas get some very amusing text. For instance for the 1967 ‘There’s Always Me/Judy’ single. .... "Summer Vacation Special by popular demand," was the legend on the cover. Which may well have been the case, except that it failed to specify just who was on vacation and at whose demand the new single was being released. With the backlog of useable material once again almost entirely depleted and a new movie underway, the Colonel and RCA selected two recordings — two terrific recordings, but two six-year-old recordings — from 1961's Something For Everybody and sold as many copies as the last single." My mini complaint here would be that at times I wish the single or LP covers were presented in a larger image, as some are a little small. Although a photo has been noted as incorrectly dated and there has been a misprint mentioned, "Booby Wood" not Bobby Wood, I have noticed no other factual errors in the short time I have had to read through the book. The final section of the book details the tracklisting and recording details for each individual CD. Again these are dotted with appropriate photos of Elvis, as well as some other interesting details such as the musical instruments used at the sessions. One of my favourite photos in the book doesn’t feature Elvis but is at the start as you open the book - the full-page image of the Studio B door! You can almost feel the magical music being created behind the door. OK, my major complaint is that the book is SO beautiful that it needs to be handled with the care it truly deserves. It would be ridiculous to leave it open or break its spine with excessive handling as it is such a gorgeous piece of work. Although the main reason for purchasing these Complete Masters has to be the Re-Mastered music, "It’s Impossible" to properly review each of the thirty CDs without boring everyone of you. The thirty CDs are divided as such, the Fifties are 4 cds, the Sixties 14 cds, the Seventies 9 cds plus three Bonus collections of outtakes and rarities. Looking at this mass of work one realises how clever Ernst Jorgensen and Roger Semon were in compiling those original three 50s, 60s & 70s box-sets plus the Movies and Gospel extra sets of years ago. All these Master recordings have been re-mastered by audio engineer Vic Anesini who’s work has been highly praised on this website since he started work updating Elvis’ sessions. If you have any of the recent RCA/SONY releases then you already know that his work is of the highest quality. 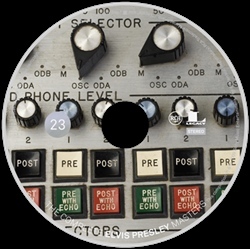 Anesini has the knack of creating a gorgeous lush sound to Elvis’ recording, providing a lovely deep bass-end to the sound and at the same time squeezing everything he can out of the high end. He works often has the "warmth" of true quality vinyl sound without the digital clipping and distortion one can often her on poor quality CD masters. Anesini’s recent audio upgrades on ‘On Stage’ and the live SONY compilation 'Viva Las Vegas’ need to be heard by every Elvis fan. If you own any of these other key Elvis releases below then you also already know his work. BMG "Genre" 2006 series of CDs. It is also worth noting that audio engineer Sebastian Jeansson - who has been credited to some marvellous FTD releases ('Elvis Is Back', 'Something For Everybody', 'Blue Hawaii' etc) - also played a vital part in the restoration and mastering of these Elvis sessions. If you want to understand what an audio upgrade can do to improve your listening pleasure look no further than the recent upgrade to Elvis’ gorgeous ‘Let It Be Me’ from ‘On Stage’. As EIN noted in the review..
.. "The audio has been Re-mastered by Vic Anesini and these recordings have never sounded better. The album now sounds like the original vinyl release but with a stunning new clarity and deep, rich sound. On the 1999 release even though the song is a Glen Hardin arrangement his piano was also buried in the audio mix. The compression also lessened Elvis’ vocal track, which for some reason also had extra echo added to it, creating a far muddier mix. Here ‘Let It be Me’ shines like never before giving an added emotional kick for the listener. This song prominently featured the (great) Imperials, a composition that perfectly fitted Elvis’ 1970 style as well as his rich baritone and featuring a beautifully understated guitar solo from James Burton ("Oh yeah" acknowledged Elvis). The mid-song verse "Each time we meet love, I find complete love, without your sweet love - TELL ME, What would life be?" is "So Elvis" and stunning in its phrasing. I may have heard it 1000 times before but it still gives me goosebumps listening it to every time! That’s the true emotional effect of Elvis and his soul breathing through every lyric for you. The Glen Hardin arrangement works so well with the strings building-up and then the delicious fade at 02.56 powering through to that emotionally stunning ending, "Take It Home." So having said that, these recent new releases obviously feature the re-masters that have been compiled into this major work. The Gospel recordings here ARE the ones used on the wonderful "I Believe" box-set. The tracks from 'Elvis 75’ are the same masters featured here. If you own the FTD Classic Albums that Vic Anesini has been involved in, then again these are the same masters used here. And boy, do they sound good! The first CD features Elvis’ SUN and early RCA tracks and they do really shine - although it is unfair to compare these to the 1992 fifties box-set versions since so much development in audio improvement and restoration has been done since then. The SUN work is as impressive as Kevan Budd’s ‘Elvis At Sun’ and here has slightly more "top-end" frequencies albeit with the slight increase in tape hiss. Perhaps the strange thing when listening through these Elvis Masters in true chronological order is for instance that the 1957 Christmas songs suddenly get interrupted by the recording of the single ‘Don’t’! Similarly the Gospel sessions later on are also interrupted by non-gospel songs. While this is truly FASCINATING hearing Elvis' musical progression as it really happened, it can also be a little annoying at times as when the gospel depth of ‘Where No One Stands Alone’ is followed by R&B raunch of ‘Down in the Alley’. And there’s some real notable shocks as when the sensational ‘Reconsider Baby’ from 1960 jumps straight to the ridiculous ‘Didja' Ever’ of GI Blues! Major Audio Improvements worth noting are..
- The ‘Love Me Tender’ session as featured on the 50’s box-set sounded like they were recorded in the bathroom down the hall! Here they sound fantastic and clear. - G.I. Blues – so different, crystal clear and with very different mixes to the 1997 BMG release. - Kid Galahad – The stereo Masters as featured on the FTD album were pretty muddied and with annoying added reverb. Here they sound great. - ‘Santa Lucia’ – where the rest of the VLV tracks are slightly improved from past releases, this new version is of an amazing quality. Where did this stunning new version of ‘Santa Lucia’ suddenly appear from! Note that the mid-sixties soundtracks, especially if Elvis didn’t attend the session and only provided vocal overdubs, are still going to sound crumby since the tape masters were poor quality in the first place. ‘Kissin’ Cousins’, while sounding slightly improved, still has to have that inherent tape hiss which sounds awful on the quieter ballads. - ‘Roustabout’ gets a great audio upgrade with a nice new wide stereo spatial spread. Interestingly the title song features echo on Elvis’ vocal track that was absent from the ‘Double Features’ version. - ‘Girl Happy’ features the newly found tape masters. A nice upgrade on the original FTD soundtrack release version with less added false reverb and far less muffled. ‘Harum Scarum’ and ‘Frankie & Johnny’ however still sound woeful. A muffled "nearly mono" mess. No wonder the FTD soundtracks of these sounded rotten. To make these listenable one really has to go back to the studio tapes and start again, as was done for the fine-sounding "Double Features" versions. ‘Speedway’ similarly sounds as if it was recorded in the bathroom with a terrible added reverb across all the masters. For some reason the track ‘Let Yourself Go’, while still having the reverb, does not sound as bad as the others. - At this point it is such a relief to get to Elvis’ musical resurgence and the "How Great Thou Art" session on CD 13. After all the soundtracks it’s a total pleasure to hear creative recordings such as ‘Guitar Man’ and ‘U.S. Male’ (which sounds so good it could be a new tape source), as well as ‘Edge Of Reality’ in such great quality. - ‘The 68 Comeback’ - How odd listening to this in chronological order, the classic intro ‘Trouble’ now being track 3! The audio revelation here is that Anesini has re-edited the "informal" session track so it now features the crystal clear version as ex the session tapes. The terrible hum that was so obvious on his original mono LP master version from the "The Complete Comeback Special" deluxe release has now gone. Similarly the Stand-Up portion is extra clean. ‘If I Can Dream’ also uses the goregous stereo mix not the mono album Master. - There is little more that I can add about the 1969 ‘Memphis Sessions’ as they were perfectly represented on the recent ‘FEIM’ Legacy release. The Stereo versions of ‘Suspicious Minds’ etc are used here. - ‘Change Of Habit’ gets a new and noticeable audio upgrade. - ‘Bridge Over Troubled Water’ is the once again the original studio version with the fake live audience ending. - I appreciated the ‘Elvis Country’ songs which are the stand-alone studio master versions without the "Thousand Years Ago" fades in and outs. While these versions were on the 70’s box-set, here they sound greatly improved and with totally different mixes to the versions released on the original 'Elvis Country' album. It is a real delight hearing these songs running to their full-length again and in this quality. ‘Little Cabin On the Hill’ has that lovely extra guitar intro, while other tracks such as ‘Washed My Hands’, ‘Faded Love’ and 'It's Your Baby' run much longer beyond their "Elvis Country" edits. - Plenty of other tracks stand-out in these new audio re-masters such as the live ‘You’ve Lost That Lovin’ Feeling’ which has a great new mix and sounds magnificent. It makes you want Vic Anesini to remix the complete August 12 1970 concert "Possibly Elvis’ best ever concert"! - Other early 70’s tracks such as ‘Until It’s Time For You To Go’ and ‘American Trilogy’ all sound so much better than their old releases and have been recently used on the FTD Classic Album series. - ‘Live At Madison Square Garden’ is another highlight. While the speed hasn’t change and the concert still sounds as if Elvis is rushing to catch the bus, this at last gets the audio upgrade it deserves with some fabulous clear percussion now shining through. In comparison the old CD release now sounds as it has been recorded through a sock! - The STAX sessions are the same splendid versions recently done for the FTD ‘Classic Album’ releases. - Similarly while the ‘Live On Stage in Memphis’ original album is remastered nice and clear here and with no reverb, it still has that silly original "fake crowd" overdubs that I always thought spoilt an otherwise fine concert presentation. Unfortunately it also does not feature the full concert since the extra tracks, put back in on the rather fine ‘Live On Stage in Memphis’ FTD release, are obviously not included here. - The 1975 ‘Today’ sessions are slightly improved upon from the FTD versions, while it is hard to improve on the Felton Jarvis much-overdubbed Jungle Room sessions where Elvis voice is always going to be buried under layers of superfluous sweetenings. - Oh yes, and Elvis’ dog is back barking at the end of the ‘Way Down’ fade-out - which certainly wasn’t on my vinyl original! All too soon one is listening to ‘Unchained Melody’ and it’s hard to believe this journey through Elvis musical career is over. The final three bonus CDs are a compilation of important alternate takes, live concert performances and other rarities. (You can see the full tracklist here). The first bonus CD is the smoothest listen being a compilation of Movie alternates. Where they have appeared on FTD soundtracks mastered by Lene Reidel she has obviously used her own re-masters. The longer ‘One Broken Heart For Sale’ sounds fine (much better than the earlier 'Collectors Gold' version) being taken from the FTD 'World's Fair' soundtrack. However tracks like ‘Can’t Help Falling In Love – movie version’ sounds dreadful having been copied from the low-audio-quality ’97 expanded "Blue Hawaii" CD. This has been upgraded for the FTD soundtrack last year (as noted here in our Blue Hawaii FTD review) so why on earth wasn’t the new version used here? Other tracks such as ‘Black Star’ are also not improved upon on their earlier ‘Collector’s Gold’ releases. Worth noting is the alternate ‘I’m A Roustabout’, a definitely upgraded version, which was discovered in 2003. Here the audio has been totally re-equalised and it sounds great, miles better than on ‘2nd To None’ release. Third bonus CD is a very different mix of home-recordings and a few studio alternates. Elvis’ first four sun-recorded acetates are here, slightly cleaned up (hiss reduction) from their previous ‘Sunrise’ outings. Otherwise all tracks seem to have been compiled from their original versions which means a stunning room-shaking ‘Latest Flame’ studio alternate to some very bumpy audio on the home-recordings (taken straight from the cd of the same name). The very end of the thirty cds goes from the ridiculous ‘Froggy Went A Courtin'’ jam, to the sublime ‘I'm So Lonesome I Could Cry’ at Sam Thompson’s house finally ending with the poignant ‘The Twelfth of Never’ rehearsal. It would be wrong for me to suggest that everything was perfect within these 711 Masters and I would certainly flag these few mini annoyances. - ‘Follow That Dream’ – The dreadful mono versions sound woeful, and out of context here. Ernst Jorgensen has stated that the Stereo Masters are missing and recently an alternate stereo take has been used on other soundtrack releases. Unfortunately for a "masters" release this was the only option. The stereo Master of 'Angel' has however been found and sounds brilliant, which of course makes the other tracks sound worse! - ‘Stay Away Joe’ has a terrible original tape fault on the right channel. This was the same on ‘Double Features’ set but the channels were swapped there. - ‘Rags To Riches’ has a terrible "damaged tape" beginning. This was actually edited off on the 70’s boxset version but cleverly fixed up for the ‘Love Letters’ FTD Classic Album release. - ‘Aloha From Hawaii’ – I was hoping for so much here but the original master tape must have been a bad mix. The audio here has some bad compression and added reverb giving it a very muffled sound. There is no shine to the percussion. This time the 1998 CD version, remixed by Dennis Ferrante from the multi-track tapes sounds much better with crystal clear percussion and biting guitar and Elvis’ voice much clearer without added reverb. While the audience response may be a little high in level at times there is a real involvement in the show that the LP master does not have. - ‘Its Midnight’ where for some reason Elvis’ vocal is buried in echo here when the mix was so much cleaner on the 70’s box-set. Overall Verdict. A project of this size perhaps deserves an even more detailed review but at 5000 words I hope I have provided enough for fans to realise that this is a magnificent project. The book is stunning, the packaging spectacular and the content is every Elvis master you will ever need. Of course every project this size has its slight disappointments but these are very minor compared to the overall impact and presentation of every Elvis Master recording sounding its very best. It IS an all-absorbing project that takes days and days to really appreciate and take in. With the second release of another 1000 copies in 2011 fans really have to consider whether they have the money to buy it. I feel sorry for overseas fans since I personally feel that it truly is value-for money at $750 - but adding hefty postage and a poor-exchange rate on top of that can make it much pricier. As the most expensive Elvis project ever undertaken thank goodness that ‘The Complete Elvis Masters’ does match its pre-publicity - and if you have the spare cash I am sure fans will not be disappointed. EIN sincerely thanks Jacqueline Feilich for her invaluable help with this review. 'The Complete Elvis Masters'2nd run, Another chance at 10% Off ! : The limited edition first run of 1000 numbered units sold out very quickly and SONY are happy to announce that the second edition is available for pre-order now and will be delivered to consumers in January 2011. The second edition will be equal in quality and design to the limited edition first run but it won’t be individually numbered nor will it contain a limited edition certificate of authenticity. Click here to order now - Follow the links and enter "Legacy10" at check out to receive 10% off. Offer valid until 11:59 PM EST December 7, 2010. The second edition will cost the same - US$750 plus postage.